It is one of the favorites of the Mongolian people. The local people call it Mongolia Lebada, meaning "Mongolia millet". It is made of millet that is steamed, fried and ground. 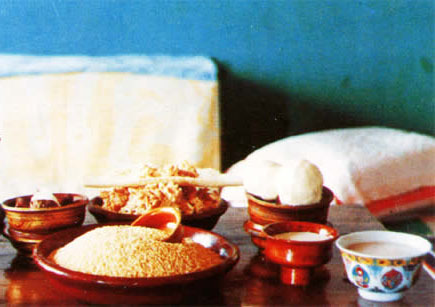 The fried millet can be eaten in several ways: with butter, cream and white sugar it hasthe taste of sesame candy; dipped into milk tea it is scented and soft. If it is eaten with a small piece of butter or cheese, it is very tasty.